Have you ever had a conversation that made you come to the conclusion that you would do everything to defend the value of what you do? I had one of those conversations recently. It was actually a brief conversation, but one that has left me pondering what I do, and the value of it, for days. I had just visited Frida Kahlo’s Casa Azul house in Coyoacan, an artsy colonial old neighborhood in the South of Mexico City, with some family members. We each moved through the house, where she was born and raised and later lived for many years with Diego Rivera and which has been turned into a museum, at our own pace. Some of us read the signs more thoroughly than others, each of us taking in the items on display in our own way and in accord with our own tastes and varying knowledge of her history. The house is filled with, to me, fascinating objects. Aside from all the original beautiful everyday household items (her kitchen is from heaven!) there are many original paintings, photographs and documents that reveal myriad aspects of how Frida and Diego lived. There are her dresses, jewelry, plaster and leather corsets and back braces, her Revlon nail polish, her prosthetic leg with a red Chinese silk shoe and jingle bells on it! I lingered for a long time in her studio, as I have on the several previous occasions when I’ve visited, taking in the energy of her creative space, her easel with a wheelchair parked in front of it, her brushes (she had brushes made out of feathers! ), her pigments, her crinkled tubes of paint (as if she had tried to squeeze out every last drop), her box of pastels, her glitter collection (for real, she had glitter!). I took in the soft midday light that fell diffused and tepid through the window panes, and thought, really, it’s not such good light for painting, but it’s an awful lot like the light in my house, the light that falls across my canvas, and I felt that pang of connection with someone who died many decades ago but who continues to be a larger-than-life ALIVE presence for so many people, female artists in particular, around the world. From Frida’s studio you move directly to her “Day Bedroom” which has her famous bed in it, the one her mother had made for her after her accident that has a mirror under the canopy so she could look straight up and paint self-portraits. Her bronze death mask lies on the bedspread wrapped in a shawl, as if to make her presence in the bed all the more real and palpable. The next room, the “Night Bedroom,” is filled with old medical paraphernalia, and you can imagine her screaming in pain to her sister to inject her with more morphine as she declined to her final days. Her ashes are in a pre-Hispanic urn on a small table in the Night Bedroom, and my son stood before it and prayed for her. I half-jokingly said, “I don’t think she’s around anymore. She’s long gone.” I thought about her famous quote, “I hope the exit is joyful, and I hope never to return.” She is gone, and yet she isn’t. She is more present than ever, not just in the energy of the place and her things, but in the way she has grown in popularity since her death as she has been recognized not only as an artist, but as a personality, identity, cook, poet, thinker, dreamer, social mover and shaker, fashion designer, creator, iconic figure representing a time period, a nation, a people, a gender, and extrapolating her iconography beyond any of those categories. She has come to represent all those who have ever sought to express themselves from the inside out. Sometimes an opposing perspective can help us validate that which we stand for. I had a conversation with a person who had not been on the day’s excursion, and the subject of Frida came up. He made a comment that he thought that Frida was no more an artist than he was a doctor (he’s not; in other words, he felt that she wasn’t an artist at all and that she wasn’t even remotely qualified to call herself one) and that she had just ridden to fame on Diego’s coat tails … that she had no technical skill and that the only master in the relationship was Diego… that she was just a big show and had gained fame only by garishly displaying her personal dramas. I was quite taken aback by such a strong opinion that was so opposed to the enjoyment I’d experienced that day reveling in her energy and her spirit so evident in her house. I responded to this negative commentary initially with some important points about the history of Frida’s life and work as I was aware of them, and then decided better to just simply change the subject rather than engage in an argument. However, the conversation has been gnawing at me …. Why? Because I consider Frida Kahlo to be the grand matriarch of the art movement within which I work. This person’s criticism of Frida’s artwork felt in some way like an indirect criticism of my own artwork. As my mind has chewed on this negative onslaught toward Frida Kahlo, I have to respond that she actually had a quite a lot of technical skill. Considering that she never had formal art education but was entirely self-taught, painting with major physical limitations, her work has a very high level of technical skill. But unlike many artists, creating a technically adept painting was not the outcome she was after in her work. Technical skill simply supported the path to what was so obviously her true mission, which was to express her inner world, to use artwork and creativity as a way to intentionally and consciously work through her thoughts and feelings. I don’t think she could help it, actually. I think if she hadn’t had her artwork, she probably would have gone crazy from her suffering. Frida stated about her artwork, I don’t paint dreams or nightmares. I paint my own reality. That her reality included a unique perspective and way of viewing the world is undeniable. I believe that she was able to view the world as much more than just the typical physical reality so many people perceive, and that is the only reality some “technically skilled” artists are able to portray. She opened the door to the possibility that dreams and nightmares can actually become your reality depending on your choosing. Using intentional creativity as her method to process both her physical and emotional pain certainly gave her a unique perspective on the suffering of the world in general, one that shows in her artwork and one that I believe makes her work so universally understandable. At the same time, she never let her understanding of suffering limit her in any way in experiencing life. To the contrary, she used it as a springboard to live life to its fullest, making every moment a creative act. By opening the quality of one’s perception and accessing other realities through creative acts, one has the power to choose a new experience in life. It is said that in her life, she showed her friends primarily her happy bright side, the Frida who loved to throw parties and to socialize, probably innately understanding from an early age that harping on her pain and suffering publicly wouldn’t gain her much friendship and popularity. She said “Nothing is worth more than laughter. It is strength to laugh and to abandon oneself, to be light. Tragedy is the most ridiculous thing.” Knowing that she lived a turbulent life , particularly the unstable but deep passions of her relationship with Diego, is probably more knowledge gained in modern times from films and books made about her, than was likely such common knowledge about her during her lifetime, so it is unfair to say that she gained fame by playing up her dramas. While she had some 30 surgeries during her life, she had very few exhibits (and only one in Mexico which she attended from her bed shortly before her death), so it is unfair to say that she rode Diego’s coattails to fame. Her fame as both an artist and an icon largely came posthumously, as modern audiences, and I’d dare to say women in particular, came to discover the intimacy of her vision and our ability to relate to it. How many of us women have looked into the mirror and seen our own image at times as dreadful, torn and frayed, our core a broken column seemingly beyond repair? What if we were to re-imagine as Frida did and use Intentional Creativity to help us see differently, to see ourselves as whole and healed? What if we chose to look again into the mirror and to see our image as a woman growing from the earth framed by dark foliage and vines and wild animals peering back at us from our own eyes? Then to look once again at our reflection and to see the compassionate all-embracing mother of us all living as a spark within? How many of us have seen our own duality? Our inner twin selves, she who plays by society’s rules and expectations and she who defies them, she who loves and she who loathes, she who dreams and she who follows, she who feels divided and cut apart at the core and she who has hope still? How many of us have bled out from our internal doubts and battles, and then pieced ourselves back together again? Frida’s images speak to all the parts of us, the good, the bad and the ugly. She offers us a reflection in her paintings, one that inspires us to our own work of using creative process to see the truth of ourselves revealed. The simplest inspiration offered by Frida in her life is that she painted and wrote privately with no real attachment to whether or not it would ever be seen by others. While she always valued the sale of a painting, she made her paintings for herself as her own healing. Whatever confronted her in life, whether public or private, she took it to the canvas, to the paper, to the paint, to work it out. There is no more powerful way to heal than to give your healing form and color, to make it real, palpable and permanent. This is precisely the way I’ve always made art and the way in which I was taught in my Intentional Creativity Movement teacher certification course by Shiloh Sophia McCloud of Cosmic Cowgirls University and Red Thread Nation – this is the way of creating that I’ve discovered really helps people and makes an impact in their lives. Since Frida Kahlo opened the possibility for women to express themselves in this way, through the decades of rapidly unfolding creative expression in general in our world, and through Shiloh’s lineage that was passed down to her via Sue Hoya Sellars, I give all my gratitude for the Intentional Creativity Movement and for the fact that I, as a woman working in Mexico in 2015, can teach intentional creativity to local village women who have never been to Frida’s house just 40 miles away. I consider Frida Kahlo to be the grand matriarch instigator of the Intentional Creativity Movement, and I thank her for having the guts in her era to do what she had to do to express herself the way she did and for leaving such a rich legacy to inspire future generations of women around the world to look deep inside themselves and to pull out their darkest shadows and their brightest light from their interior worlds and to paint it all out on the canvas. 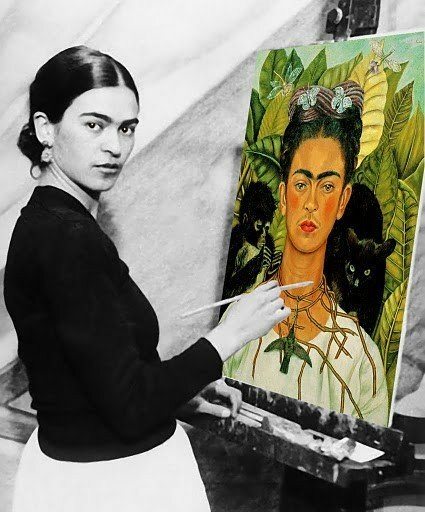 I give thanks to Frida for blazing such a brilliant trail of symbols and surreal soulscapes and magical realities – in doing so, she has given me my most powerful tools today for myself and for offering women a true path to transformation and healing – a paintbrush and a jar of glitter. I’ll defend the value of paintbrushes and glitter until the day I die. Images: photos of Museo Frida Kahlo taken by Emily K. Grieves in Mexico City. Emily Grieves received a BFA degree in art from the University of Montana in 1993, followed by study of art history in Berlin, Germany, as a Fulbright scholar. She lived in San Francisco, California, for 10 years where she began exploring symbology, mythology, and ritual in her artwork. She has been a practitioner of shamanic healing and hands-on energy work for over 17 years. As of 2004, she makes her home in Teotihuacan, Mexico, where she guides groups into the powerful energies of the pyramids, has painted murals at the Dreaming House spiritual retreat center and has created a body of artwork influenced by the cosmological imagery left in the 2000 year old pyramids. Emily is a certified coach and teacher in the Intentional Creativity Movement developed by Shiloh Sophia McCloud. She founded Taller de Arte El Refugio, an art studio in Teotihuacan, where she offer painting classes to local women and girls and provides them with a much-needed place of refuge, relaxation, and creative expression. In her art and healing, it is Emily’s intention to create portals to the sacred and to open hearts. You can view her artwork and get more information about the journeys and workshops she offers at www.EmilyKGrievesArt.com.